Although the Government has no intention of promoting clean alternative energy, we do have the individual opportunity of saving energy by cooking with the sun. 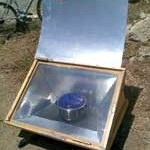 There are many different models and designs of solar ovens or cookers available on Interne: parabolic, cardboard box, aluminium reflector, and one that use car tyres! Parabolic reflectors cook very quickly at high temperatures but they are large and have to be orientated towards the sun frequently. The ‘sunstove’ is an excellent design as you only need to point it towards the south and can then leave it alone to cook, and although it can reach a temperature of 120ºC the food never burns! The original design can be found on this site www.sunstove.com, but I had to alter the design as the aluminium plate sizes are unavailable in Spain. 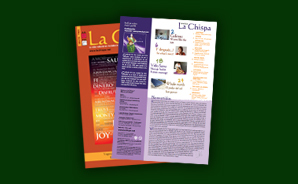 The plates can be obtained from local printers, usually for free (there are a number of solar ovens in circulation that have been from the plates La Chispa was printed on – ed). It’s basically constructed using two aluminium cases and the space between the two has to be filled with some kind of isolating material such as fibre glass, sheep’s wool, cork or corrugated cardboard. The cases are mounted in a wooden frame and a sheet of glass is needed to cover the oven whilst cooking. The base of the aluminium that faces the sun must be black in order to absorb the heat. It can be either painted black or a black ceramic tile can be placed on the bottom. Equally, the cooking pots need to be matt black with lids. It is possible to cook on sunny days in winter, but the oven must be tilted towards the sun. There is a design called 60º 30º which has 2 positions for winter and summer. This entry was posted in Whole Earth and tagged renewable energy, transition towns. Bookmark the permalink.